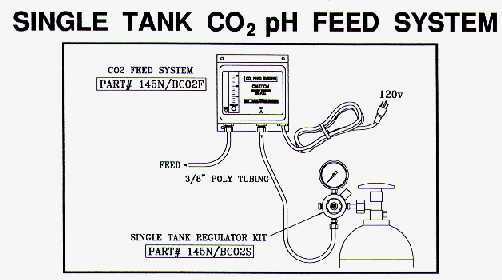 Parrish Pools USA - CO2 Carbon Dioxide Feeders - for ph control - click here. Our Top-of-the-Line CO2 dispensing systems are readily available. System includes regulator, flowmeter, and solenoid valve. Available in either single or dual mounted tanks. CO2 (Carbon Dioxide) works better with Sodium Hypochlorite. Less Bounce! Easier to Keep a Well Maintained, Balanced Pool with CO2. More Efficient! Less Hassle! It's Done Automatically. Controllers constantly are keeping the water balanced, automatically. Orders must be Pre-Paid by Visa, MasterCard, Discover, or Check in Advance. Prices are subject to change without notice. Prices are in US Dollars. All Sales are Final. Special Order items are non-returnable and non-refundable, and may require a deposit. Return Policy: Returned Items must have an Returned Goods Authorization Number (RGA) & may be subject to a 20% Restocking Fee. Volume & Special Pricing is Available. Email or Call 410-667-1177 to Confirm Prices. To Place an Order, Call us at (410) 667-1177 Mon-Fri, 9am-5pm EST, or Fax the order to (410) 667-1804 Fax. Email to custserv@ppciusa.com Fax Quote Desk 410-667-1804 Fax. Copyright 2002-2010 Parrish Pools Co., Inc. 117 Old Padonia Rd. Hunt Valley, Md. 21030 USA.